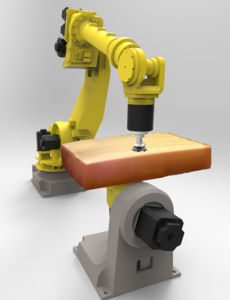 This experiment addresses a real-life industrial application involving mechanical surface treatment of products or work pieces with different shapes. A typical example, encountered in the food industry, is to remove the coating from blocks of cheese with a shaving or planing tool. To automate this process with a performance comparable to the one achieved by human workers, the prototype will be based on cheap, fast and robust 3D sensing using a limited number of laser distance sensors, which are used to generate trajectories with minimal material loss for coating removal. Although 3DSSC focuses on an application in the food industry, applications in other industries will benefit from the results of this experiment. Particularly processes involving the treatment and finishing of complex surfaces like polishing, grinding, planing or deburring will profit from 3DSSC’s results, thanks to the generic sensing and system architecture and the systematic software engineering approach.